I noticed this one was coming up for sale. It is listed in Mike Willegal's Apple 1 registry but there it is pictured in a 19" rack case and a different keyboard. Anybody know what happened to the case and original keyboard? I'm just amazed how many Views Breker gets on YouTube. the original case, keyboard and cassette drive is also coming with the sale. The keyboard was flacky; the cassette drive was non working and the case was "nice" but the powersupply wasnt trustworthy anymore. So this has been replaced to make it work but it is still included in the auction. The nice thing with this particular A1 is that every single chip and cap is date correct and authentic - nothing has been replaced. Why did it have the extra cap originally attached to the 5300uf? What was the ESR on the caps? Were the caps reformed? What was all the rework on the back for? Did they try to fix the keyboard and supply? Actually have a lot of questions, I was originally asked to work on this system and declined for various reasons. Plus the buyers preminum and vat which is about 44% on topic that. It wasn't a great condition board and didn't have a complete set of accessories from 1976. 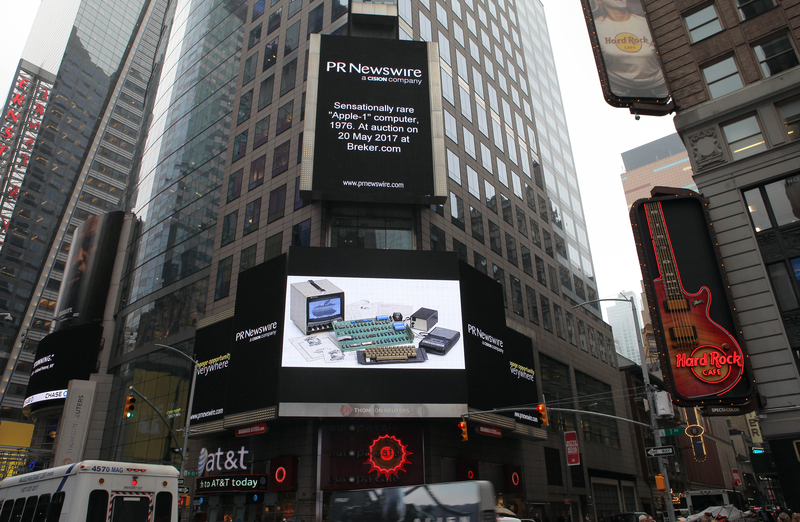 There was a story on national TV ABC network about a board today that claimed it sold for $350,000, was wired by Steve Jobs. Is tius the same A1? Lots of BS on the news stories about Apple-1 that have been for sale. This unit was not wired by Steve Jobs. This was an NTI unit so most likely it was wave soldered by NTI, chips were inserted by either Dan Kottke or Patty Jobs, and the jumpers soldered by Don Kottke or the store it was sold from. Maybe if it was an early byte shop order unit Steve Jobs might have soldered the jumpers since it was all hands on deck to get the 50 units final assembly done and tested in 30 days. All Apple-1 production units were waver soldered, neither Steve Jobs or Steve Wozniak hand soldered them. I read a story that talked about the "malaise in the collectibles" market because it only went for 350k. This was a modified Apple-1 with no pictures of the condition of the backside. You can't compare to the Henry Ford unit, which they did, which was unmolested and near perfect. IMHO, no matter what the condition, the Henry Ford Museum overpaid, by a large amount. Just a few years ago, a high price on an Apple 1, was $50,000. Back then, condition didn't matter very much, but the thought by experts is that only 30 survived. We now know that the number 30 was a very incorrect estimate. Christies just sold another unit for $355,000, so maybe that is going to be the approximate value for a while. One thing that is hurting the Apple 1 market is that the supply of known Apple 1's keeps growing, as they just keep coming out of the woodwork. I'm sure that there is a very limited number of collectors and institutions that are both interested and can afford 5 figure investiments. In the end, it's all about supply and demand. I don't know if there are so many still coming out of the woodwork, that seems to have slowed. Before the Henry Ford, there was the two that sold at Breker for over 600k. 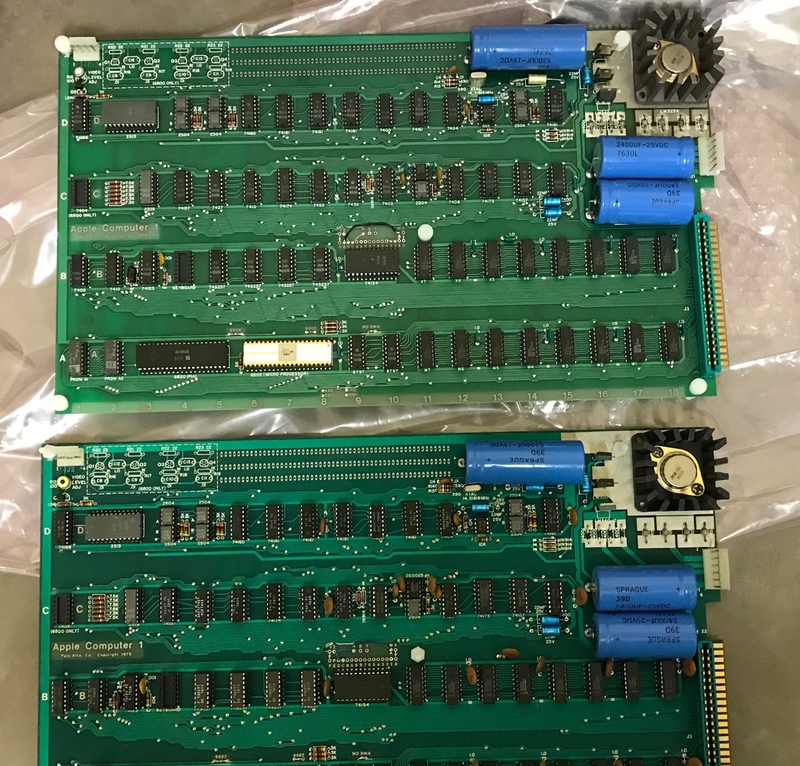 Both weren't in as good condition as the HF one, but were in better condition (board level, not original chip level) than the ones that sold in the 300 to 500k range. The 50k Apple-1 at auction disappeared after Steve Jobs died. The only post Steve Jobs Apple-1 that sold for less than 100k at auction was the Huston Brothers #2, which had a board fire (I have very hi-res pics of the carbon damage) and had major chunks take out of the power supply traces on the back. I would have thought there were a limited number of collectors and institutions except lately I've been getting into other types of high price collectibles and it's amazing to me how many 500k Complication Watches are sold every year that will never be worn on a wrist and only put on display. So when you get into the big money, I think there is more of it out there than we think. Not all Bill Gates/Jeff Bezos kind of money there are many people worth 100m to 600m who can afford to invest in this kind of stuff and they do. Luckily It was not 44%. I had to pay 19.3% + 19% VAT. All together about 23%. You pay VAT on buyers premium not your final bid. The final price was pure luck. So many people had not all facts but wrote about ‘time for high prices for A1 is over’. But they were all wrong and to fast with this judgement. A1 in pretty bad condition were sold for way more in 2017. And more will be seen in the near future. Condition of this A1 from Breker 2017 auction is pretty good and it is working. Everything (except 2 sockets) is original, all electronic parts are original and just some added parts from 1st owner. Not like many A1 that got later spare parts / replacements. 1st owner just replaced 2 sockets and that is all. I could easily remove all added wires etc. and it would looks like in any advertisement from ’76. But I like it as it is. Most A1 owners in early days used this computer as a platform to get deeper into computing and programming. I did the same with my first IBM 5150. I added parts, changed crystal, modified graphic cards to use 2 monitors at the same time by switching ports etc. – like so many typical owner of early computer. And yes, I still got these cards. It was fun to modify hardware and fun to try undocumented interrupts etc. A1 was designed to add some components – that was a feature. A1 was a computer for enthusiasts and people with some skills or at least you must have some curiosity. And yes, it is not a full set. This year 2 A1 are sold for 350K/401K US$ and all are really 'incomplete'. The one for 350 have seen much better times. So overall I am pretty happy with this piece of history. And it got some adds like this keyboard in wooden case from 1976. Pretty nice. So many people just look to the price and too many people forget the importance of any A1 from a historical point of view. Buy a classic car or old painting for high price and nobody cares. But it is the same with classic computer. Thanks for sharing the “inside” story and congratulations on your success with this auction. Would you mind sharing some high resolution photos of the board for those of us building replicas to study? How do you intend to display your A1? It is already in a bank safe. But I don't like the idea of A1 hidden in a safe. I will find a bigger museum to bring it on display. So everyone can have a chance to get a close look. I believe historical pieces like this have to be displayed in public. You can always visit your Apple-1 every few weeks.... and you can take them out for vintage computer shows to share with the public. I feel grateful to live in a place where I wouldn’t have to keep my Apple-1 (if I owned an original, which I don’t...yet) in a safe or bank vault. Corey, which boards are those in the photo you posted? These are my Apple-1 boards during a visit to the bank a few months back. One is an NTI and one is a Byte Shop. I live in a nice neighborhood, but why keep them at home? There is more than a risk of theft, that's why I have a Mimeo. If I need access to an original Apple-1 for a demonstration, show or TV interview, I can just grab one from the bank and then put it back when I'm done. Would you say that your ownership experience has been what you thought it would be when you first started down this road? What is the best part of owning your Apple-1’s and what, if anything, has been disappointing? I’ve considered risks such as fire or water damage as well with my collection, but at the same time I don’t think I would be as passionate if I couldn’t enjoy them whenever I wanted to. Obviously my entire collection is worth less than a single Apple-1, but it would be harder for me to replace than to acquire an Apple-1. I keep my collection in my office...at home there’s the risk of kids and that trumps fire & water any day. Well the NTI board I won't ever sell while I'm alive, it's near perfect. The Byte Shop board is my 3rd try. I'll keep upgrading till I get a perfect one. I enjoy taking an Apple-1 to computer shows or to elementary and middle schools for demonstrations. I like seeing people excited to see how primitive it is even compared to the Apple II. The Mimeo is a perfectly good substitute on a daily basis as many current original Apple-1 owners have one as their daily "driver". It makes it special when I power on an original. Another cool thing is meeting other owners of original Apple-1. I have met some pretty amazing people who are as passionate as I am about early apple computers. As for keeping at home, my kids are older so I don't expect damage from them, but accidents do happen. Heck I dropped something on top of my Altair by mistake. Lucky for me I had my clear plexiglass glass cover not the painted original one on so I could buff out the scuff from the non-stock plexi cover. Thanks for sharing! Any plans by either your or Mike to update the Apple 1 Registry? There’s been quite a few changes since it was last updated that would be of interest to the rest of us.